Smoot Hawley Back With A Vengeance? Index futures have plunged Tuesday night on news that Gary Cohn, Trump’s top economic adviser, is resigning. The selloff has brought the E-Mini futures down to within an inch of triggering a ‘mechanical’ buy I’d flagged at 2687.00. Ordinarily I’d say jump on it using the precautions I’d advised to set up a low-risk entry point. After all, who the heck is Gary Cohn, anyway? I could not have answered that question myself until an hour ago, and that’s why “buying the news” would seem to be a no-brainer here, especially seeing how brutally DaBoyz’ have shaken the tree this evening to produce bargains. But Cohn, as it happens, was the chief opponent of Trump’s plan to enact tariffs on steel and aluminum. This means having him out of the way could smooth the way for policy change that could conceivably have dire consequences for world trade. 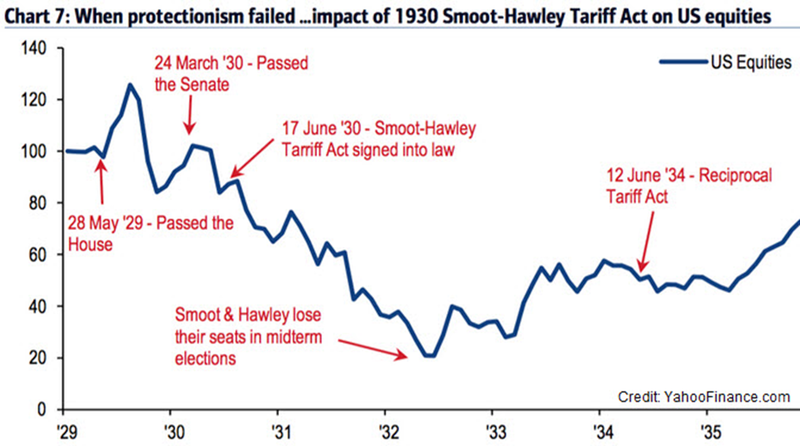 Some market historians have tied the 1929 stock market collapse and the gyrations that preceded it to ongoing headlines concerning the Smoot Hawley bill as it worked its way through Congress (see inset). The evidence is persuasive that the law’s embrace of protectionist sentiment — it raised tariffs to record levels on more than 20,000 imported goods — was a key factor in triggering the stock market crash and the Great Depression. Is history repeating itself? If so, we should see the markets become increasingly volatile, especially whenever price movement is accompanied by news concerning Trump’s protectionist regime. It may seem like background noise as legislative haggling plays out on Capitol Hill. But let’s remain open minded to the possibility that tariff talk will be the death knell of the great bull market begun exactly nine years ago. In the first two weeks of June 1930, just before President Herbert Hoover signed the bill into law, the Dow Industrials fel l 23 percent. Investors may have a short memory, but Smoot Hawley’s pernicious effects are too deeply etched in history for Wall Street to ignore. Is this evening’s sell-off a shot across the bow? We’ll likely know by summer or autumn, if not sooner.